You may come over for a visit and see a different looking blog. I am looking around the internet for an upgrade to the simple banner that my son and I made. It has been fun trying on new backgrounds. The Background Fairy has some beautiful pages. The one I am sporting now comes from there. It is not exactly what I was looking for, but the best I have found so far that does not clash with my header. I love her work, but I need a certain green and gold to match mine. I have a picture in my mind of old text paper background. And for now, my site might change on and off as I try on new looks! I might even try a new header. It is so much fun to play! The pic is from my new camera. I am learning how to use it and very happy with the results! In the mean time, I am working on about a dozen different projects that I hope to post about this week. Good luck with your new look! 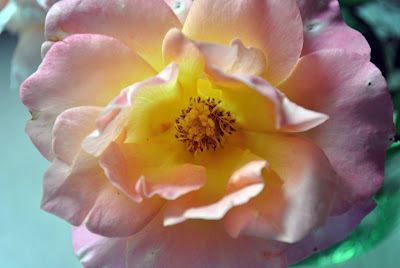 I love the rose - I can just imaging how it smells - I love the 'blush' type roses.